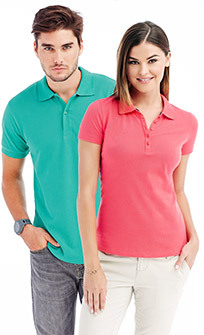 In 2015 our Stedman® Stars are truly enjoying their VIP-status and we added some jaw-dropping new products, for example the high class polo shirts HENRY and HANNA! New fashionable details set accentuating highlights, such as HANNA’s narrow placket or HENRY’s contrasting herringbone tape at the neck and side seam slits. Our new polo is charismatic and classy, a real team player in the first league - thanks to outstanding quality and superb workmanship: perfectly suited for many occasions, for the casual business look as well as an evening in the city. With a contemporary fit, HANNA & HENRY are also very comfortable – thanks to 100% finest cotton piqué - and offer best quality above all, making them versatile companions for everyday life and leisure, perfectly matching jeans or chinos as much as suits of course. 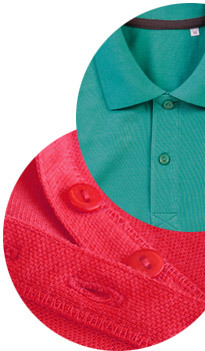 Brilliant new colours like Bahama Green and Salmon Pink are guaranteed eye-catchers.